Home to one of the 7 wonders of the world, the Taj Mahal, Agra is a sneak peek into the architectural history with other structures such as Agra Fort and Fatehpur Sikri and hence makes for a must visit for anyone living in or visiting India. When you talk about Agra, one thing has to stand out - yes, the Taj Mahal. Agra is host to the only one of the Seven Wonders of the World in India, Taj Mahal, which makes the whole country proud. But that's not the only thing Agra has to boast of. Agra has three UNESCO World Heritage sites and Taj Mahal features in the 50 most popular tourist destinations in the world. History, architecture, romance all together create the magic of Agra which is almost the lifeline of Indian tourism. History fanatics as well as architecture buffs can have a ball here with the sheer expanse of the Mughal art and culture on display. Apart from its monuments, the city also has some exciting stuff for foodies - including the famous Agra ka Petha and amazing chaat and Lassi. What is widely considered as the most beautiful building in the world, Taj Mahal is located in the historical city of Agra. Called as the "symbol of love", it was built by the Mughal Emperor Shah Jahan as a memorial for his third wife, Mumtaz Mahal. Every year visitors numbering more than the entire population of Agra passes through the magnificent gates to catch a glimpse of this breathtaking monument, and only a few leave disappointed. Shah Jahan said about the Taj that it made "the sun and the moon shed tears from their eyes". The Taj Mahal stands for the Crown of Palaces in the Persian language. It rises from the dust-beaten earth of Uttar Pradesh, but even the wildest imaginations leave visitors underprepared for this world wonder. It is a breath stealing moment when the gates of this monument are traversed, and the Taj Mahal comes into focus. It is considered as the finest example of Mughal architecture and is now a UNESCO world heritage site. Covering a land over 60 bighas, the Taj Mahal was constructed using white marble obtained from Makrana in Rajasthan. Rabindranath Tagore described it as "a teardrop in the cheek of eternity" while Rudyard Keepling said it is "the embodiment of all things pure". It took almost 17 years to complete the construction of the Taj Mahal, and it was finally completed by 1653. The tomb is laid out in a rectangular shape, and that can be approached through a massive gateway which has an arch and alcoves on either side of it. The Taj, so majestic from the exterior, has equally splendid artistic work done in the interiors. There are water channels and fountains in the entrance which makes the monument even more spectacular. Simply said, it is the most beautiful building in the world, and it's impossible to see it without feeling wonderstruck! Also known as Lal Qila, Fort Rouge or Red Fort of Agra, the Agra Fort is a massive fortification located on the right bank of the river Yamuna in Agra, Uttar Pradesh, at a mere distance of 2.5 kilometres from the world famous Taj Mahal. Encompassing an entire city within its walls, this imposing structure was built in the year 1573 by Mughal supremo Akbar himself. Agra Fort was the main residence of the Mughal up to the year 1638 when the capital was shifted from Agra to New Delhi. Owing to its historic importance and bedazzling construction, the Agra Fort has also been listed as a UNESCO world heritage site. Agra Fort is one of the most special monuments built by the Mughals and has richly decorated buildings. It is the perfect example of the Mughal style of art and architecture and is one of the most visited tourist spots in Agra. Built purely out of red sandstone, this expansive architecture stands out against the soft azure of the sky. Within the premises of the fort lie the most exquisite architectures of the Mughals like the Pearl Mosque, Diwan-i I Khas, Diwan-i I Aam, Moti Masjid and Jahangiri Mahal. Each and every one of these edifices has remarkable handiwork and ornamentation, which make this place a delight for every history and architecture lover. You can also get a very splendid view of Taj Mahal from the Agra Fort. A city, predominantly made of red sandstone, Fatehpur Sikri was founded in 16th century by Mughal Emperor Akbar. Back then it was the capital of his Empire for fifteen years. Now a UNESCO world heritage site and a famous tourist attraction, it is a fine example of Akbar's architectural finesse. Fatehpur Sikri is a home to Jodha Bai's palace , Jama Mosque, Buland Darwaza , and a Tomb of Salim Chisti. A unique blend of architectural excellence, as well as religious beliefs, sums up to the definition of Fatehpur Sikri. This monument was built by Akbar to honour Sheikh Salim Chisti, whose prediction of the birth of a Mughal heir came true. Along with it, he built a stunning mosque which is still in use today. Construction of three palaces for each of his favourite wives, one a Hindu, one a Muslim and one a Christian took place. An Indo-Islamic Masterpiece, Fatehpur Sikri is enclosed by an 11 km long fortification wall which has various gateways. A paradise for History bugs and Photography nerds, this place is a must visit! You can go on a one day trip from Agra to Fatehpur Sikri. Often referred to as the "Baby Taj Mahal", the tomb of Itimad-ud-daula is a Mughal mausoleum and is often regarded as a copy of the Taj Mahal. This is the first tomb in India made entirely of marble. It is the tomb of Mir Gheyas Beg, who was a minister in the court of Shah Jahan. Visiting this tomb is like taking a step back in time into Agra's history. Itimad-ud-daula's Tomb marks the transition from the first phase of the Mughal architecture to the second. This was the first structure to make use of pietra dura and the first to be built on the banks of the Yamuna River. It basically consists of Indo-Islamic architecture, with the use of arched entrances and octagonal shaped towers. If you take a bird's eye of the monument, it looks like a jewel box set in a garden. This magnificent mausoleum, built on the banks of Yamuna, was to inspire the construction of one of the wonders of the world "Taj Mahal" in the later years. Jama Masjid at Agra also known as the "Friday Mosque" is a seventeenth-century structure and is one of the largest mosques built by the Mughals in India. Constructed under the reign of Shah Jahan in 1648, Jama Masjid is dedicated to his favourite daughter Jahan Ara Begum. This splendid monument is visible from the Agra Fort with the Agra Fort Railway station right between the two structures. Jama Masjid has huge significance in the Indian history and culture and has been intricately designed with multi coloured marbles and sandstone. The Jama Mosque is built mainly of red sandstone and white marble giving evidence of the magnificent Mughal architecture. The design of Jama Masjid is unique with a fountain at the centre and supported by four kiosks in the courtyard. The interior walls have scriptures in the Persian style containing words of praise for Shah Jahan and Jahan Ara. The inlaid panels of work here is quite similar to that of Taj Mahal and is common to all the monuments and structures built by the Mughals in Agra. Every Friday, special prayers are conducted at this mosque which is attended by thousands of devotees. The Tomb of Salim Chisti is a part of the mosque compound. Located just north to the glorious wonder called the Taj Mahal and overlooking the Agra Fort and Yamuna river on the opposite side, Mehtab Bagh is a rare retreat of natural bliss and one of the most scenic spots in Agra. Perfectly quadrilateral in shape and colloquially known as the Moonlight garden, the garth is the last one of the eleven similar Mughal- built garden complexes along the Yamuna bank. Laid out in just the right symmetry and perfectly aligned with the Taj in view, the garden provides ample mesmerising sights and picture-perfect moments for the photography fanatics and nature enthusiasts. The park has four sandstone towers, one each at the corner with a huge octagonal tank right in the centre. It is believed that Shah Jahan especially got the bagh designed for his personal interests so he could come up here and admire the infinite beauty of his favourite piece of art. A lot of thought went into the construction of the garden so as to capture the perfect reflective image of the mausoleum. On the moonlit nights, the clear reflection of the wondrous Taj Mahal in the waters of the park is a sight beyond description. Even on regular days, any ordinary visit can be made memorable with the marvel of a monument in the backdrop. Mehtabh Bagh is now a horticulture delight with scores of vibrantly blooming floral plants and medicinal herbs, besides the umpteen fruit trees, which add to the beauty of the park. Established in 1995, Wildlife SOS is a laudatory initiative started by a group of individuals to work in the direction of protecting and conserving wildlife, maintaining quality habitats, and safeguarding rich biodiversity. Focusing on creating sustainable livelihood measures, the movement makes elaborate efforts to protect the depleting environment. From the majestic elephants to terrific tigers, sloth bears to other endangered animals, this is a commendable manoeuvre to help save the jeopardising planet by educating people about the hazards of animal captivity, poaching effects and reptile hunting etc., and make a difference. The organisation works tirelessly to rescue wildlife in distress, work against animal cruelty and collaborates with different communities to educate them about conserving and preserving the rich wildlife. Wildlife SOS is most popularly known for their applaudable work of saving around 600 ?dancing bears? from the tribal people. Not until long ago and sometimes even now, the tribals trap bears and train them to dance for the people as a mode of street entertainment, in return for few bucks. While the process is all about animal abuse, the bears also go through a lot through the tough training in order to be tamed. Wildlife SOS is an initiative to save the poor creatures from the clutches of this brutality. The rescued bears are treated with great care at their rehabilitation centres and are put in an artificially modified natural habitat. In addition to this, Wildlife SOS also has several other active projects on leopards, reptiles and environmental conservation in general. Located inside the Taj Mahal complex, the Taj Museum was established in 1982 on the western ends of the Taj Gardens. The tiny but terrific depository is a double-storeyed building with a quadrangle projection outside. Situated a little left on the main gate of the mausoleum inside the Jal Mahal, the museum provides the wonderful opportunity to have a close look at the blueprints, arts and artefacts used in the construction of the world-class monument. It also houses paintings displaying the construction and planning of the graves of the Emperor and his Emperess and the angles measured are so, that the foot of the graves always faces the spectators. As the name suggests, the museum is all about telling the tale of the Taj. It is a popular place of visit among the travellers as it is home to the facts and history relating to the magnificent monument. You can also find gold and silver coins minted in Agra at the time. We recommend you to visit the place if you are in for a little historical and factual retreat. Dedicated to the memory of the Prime Minister of the court, during the reign of the Mughal Emperor Shah Jahan, Chini ka Rauza is a funerary monument situated on the eastern bank of the Yamuna river in Agra. Also known as China Tomb, ?Chini? meaning ?from China? and ?Rauza? meaning ?tomb?, the shrine is the final resting place of the Persian scholar and poet- Allama Afzal Khan Mullah. Built between 1628 and 1639, the architecture is a marvellous fusion of the Indo-Persian style. The monument located 1 km north of Itmad - ud - Daulah tomb, is hidden away in an alcove of trees and is usually an unusual but a happy discovery among tourists. It is supposedly the first of its kind to be decorated by glazed tile work. The tiles are known to have been imported from China which makes the monument even more striking with their colour embellishments and artwork. Although the enamels and inlay work is wearing off due to climatic conditions and absence of renovation, the tomb is a fantastic example of long-gone style and architecture. Agra is primarily known for its monuments, forts, palaces and mausoleums, but, hidden behind these architectural wonders are the traditional shopping centres and bazaars. It is home to some of the finest handicraft and artefacts markets. The shopping scene in Agra is buzzing with markets, department stores, retail outlets and local bazaars. Agra is home to many people like the artisans, jewellers, embroiders, carpet makers and weavers who come here to showcase their precious talent. Agra is one of the largest markets for embroidery and textiles. Most of the major shopping complexes are situated near the Taj Mahal, the most famous ones being Sadar Bazaar, Kinari Bazaar and Munro Road. If you want to buy ethnic clothing, footwear and accessories, you need to head out to the Sadar Bazaar. The Kinari Bazaar is home to a wide choice of handicrafts, along with marble, glassware, rugs, leather and textiles. Apart from offering exquisite items, these bazaars are also reasonable providing umpteen opportunity to practice your bargaining skills. If shopping is on your mind, then Agra won't leave you disappointed! "There are no great things, only small things with great love" - Mother Teresa Mother Teresa is a woman beyond description, beyond words and beyond introduction. An Albanian by birth, she had been brought up by a single mother. On a yearly trip to the chapel of the Madonna of Letnice, she knew what her calling in life was, and that?s when she decided she wanted nothing from the world but to provide peace and solace to those who were suffering. She moved to India in 1929; by 1931 she had taken her vows, and by the end of 1950, she had set up her first Missionaries of Charity. It was an honest effort to serve ?the hungry, the homeless, the naked, the crippled, the blind, the lepers, all those people who feel unwanted, unloved, uncared? and basically anyone and everyone who was in need of comfort or care. At the time of her death in 1997, the Missionaries of Charity was operating in 123 countries on over 610 missions which included providing hospices to the homeless/ the ones diagnosed with AIDS/HIV or leprosy, in addition to operating several orphanages and schools and charity homes for the orphans and the elderly. One of these charity homes is based in Agra and goes by its staple name- Mother Teresa?s Missionaries of Charity. It works for the upbringing, well- being and education of the orphaned kids in addition to caring for the elderly and the homeless. We recommend you to stop by at the Missionaries centre for an hour or so, to pay respect to the commendable effort taken up by Mother Teresa and the ?mothers? who selflessly follow her. Spend some time with the unprivileged, share some smiles, and realise your many privileges. Take a tour of the premises and observe the unconditional love and nurturing that the nuns share with the kids and the elderly. If possible, leave a small donation and help make a huge difference for the good work to continue. If nothing, we promise you peace and extreme thankfulness, on your return. Built in the memory of Huzur Swamiji Maharaj (or Shiv Dayal Singh Seth), this complex is a living tribute to his dedication towards founding and carrying forward the Radhasoami Satsang movement. The garden houses the 'samadhi' spot, or the mausoleum of Swamiji, who founded the Radhasoami Satsang in 1861, based on an amalgamation of the principles of Hinduism, Christianity, Buddhism, and Sikhism. The complex is renowned for being a work-in-progress for the past 80 years or so, where devotees undertake the final dream of creating the complex with a gold-latticed dome. The architecture here follows the same principle of co-habiting different religious sects, with various styles of architecture coming together to create a unique experience. The garden complex also has a 'Bhajan Ghar' (or prayer house), which almost always is hosting some event of the 'Radhasoami Satsang'. A mosque that shines like a pearl in a moonlit night, hence also known as the Pearl Mosque, Moti Masjid is one of the oldest mosques in the city. Located inside the Agra Fort, this mosque is made entirely of white marble which explains its name and the phenomenon related to it. Though it is not open to public for offering prayers, it is otherwise open for all the visitors from around the world. The mosque is said to be built by Shah Jahan for the people of the royal court. The magnificence of the place is elevated by the side arcades made of white marble. Interestingly, some of the domes along the parapet are built in Hindu-style, offering a curious mix of two very different cultures. The glorious mosque took nearly four years to complete and is built in a style that is typical to Shah Jahan's era of reign. When the Persians came to India, they had to find newer ways to endure the tropical climate, especially the harsh summer months. The Panch Mahal is example of this phenomenon, a pillared, 5-floor structure built as an escape from the heat. The pillars allow breeze to pass through, creating a natural airway and ventilation to keep the climate cool. There are 84 pillars on the ground level, 56 on the first, 20 on the second, 12 on the third and 4 on the fourth level. The top is covered with a traditional chhatri-style dome. Pillars also have beautiful carvings with the typical Mughal motifs of rosettes, floral vases or arches. 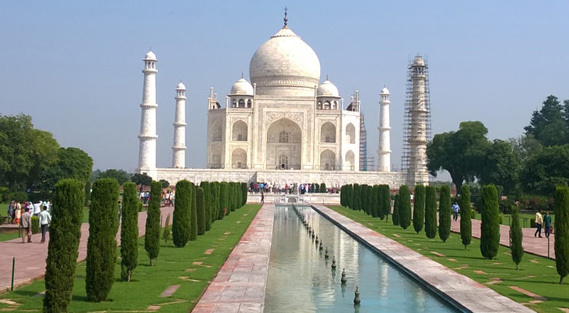 When you hear Agra, you'll automatically think of the magnificent monuments that dot the city. But there's a little (or rather a vast) treasure hidden in the woods of Agra, offering you a chance to explore the Taj in a serene and somewhat offbeat way. Walk through the Taj Nature Park, an initiative of the Social Forestry Division of Agra, and experience the beauty of Taj from various angles and settings. You'll be walking through a 9 km trail, while various species of birds and wildlife and rare trees and shrubs keep you company. There are also elevated photo points, which give you the opportunity to capture the Taj with a backdrop like nowhere else. The area consists of rifts and valleys, a natural ridge area with pathways for the visitors' comfort and guidance. With different hues offsetting the pristine white of the monument of love, you're in for a literal visual treat. Jahangir Palace, located inside the Agra Fort, is one of the largest palaces built within the premises of the fort. This palace was built by Mughal Emperor Akbar for his beloved son Jahangir and hence, the fort was named as Jahangir Palace. The amalgamation of the Central Asian Architectural Style and the Hindu Architectural Style used in this fort is admirable. In front of the structure is the famous Anguri Bagh, where the queen used to spend her evenings. One of the ancient temples devoted to Lord Shiva, Mankameshwar Mandir is located in Agra. To reach the sanctum sanctorum one needs to descend down a score of stairs. It is believed that the shivling (covered by silver metal) was founded by Lord Shiva himself. The temple has one sacred place which has the statue of Lord Shiva and is surrounded by typical Shiva family idols. It is also believed that Lord Shiva himself said once that whoever wishes in Mankameshwar Mandir, all their wishes will be fulfilled. Remember not to wear any leather items, salwaar suits, pyjamas and pants on your visit to the temple. People must only wear traditional Indian attires that are dhoti and sari.